Enjoy an abbreviated, yet comprehensive, tour of our nation’s capital! On this 4-hour tour, you’ll find unique opportunities to explore and learn the history of each site and attraction as your guide walks the sites with you. Enjoy visiting DC as you are transported via luxury tour bus to the historical monuments, museums, and landmarks. 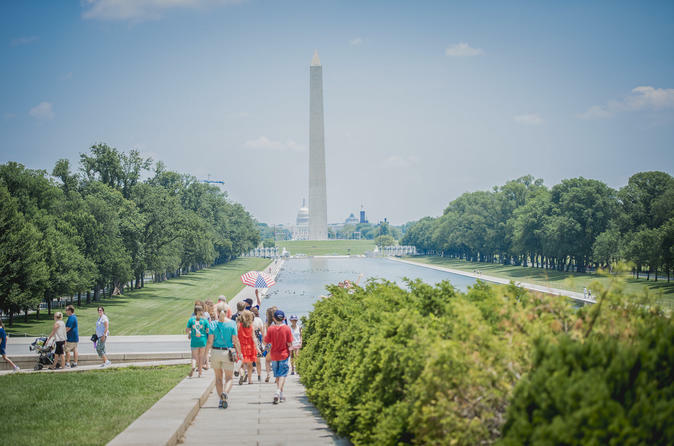 Discover the best of what DC has to offer on this guided tour. Your sightseeing journey of Washington, DC begins at the U.S. Navy Memorial, located in the heart of the capital, halfway between the White House and the U.S. Capitol Building. On your way to the U.S. Capitol Building (first stop) you will pass the National Archives, which houses historic U.S. documents - the “Three Charters of Freedom” (the original Declaration of Independence), The Constitution, and the Bill of Rights. Next in view are the Newseum, the Canadian Embassy, and the National Gallery of Art. Emerging in sight is the U.S. Capitol, where you will take in a view of the two-mile long, panoramic view of the Smithsonian Museums (the largest museum complex in the world), and the Washington Monument (the tallest, freestanding stone structure in the world)! On your way to the White House, you will pass the U.S. Botanic Garden, Grant's Memorial, the U.S. Navy Memorial, the Robert F. Kennedy Department of Justice, and the J. Edgar Hoover Federal Bureau of Investigation. When arriving at the White House, you'll see the Executive Residence of the President and his family, as well as the Eisenhower Executive Office Building. This stop also includes a walk past Lafayette Park, honoring the Marquis de Lafayette, leader of French revolutionary forces. Your next stop is the National World War II Memorial. Along the way, you will see the headquarters of the American Red Cross, the Daughters of the American Revolution, and the Organization of American States (OAS) - representing the U.S., Canada, and 35 Latin American countries. Onward, to the Reverend Dr. Martin Luther King, Jr., Memorial – dedicated in 2011 – located just across the Tidal Basin. On the walking part of the tour, you will also visit the Korean War Veterans Memorial, and via a nice stroll along the tree line, you will emerge in front of the Lincoln Memorial and Vietnam Veterans Memorial. As we near the end of our journey, we board the bus once more for a visit to nearby Northern Virginia – with a drive-by the Iwo Jima Memorial, which is currently under renovations, set to re-open by fall of 2018. We end the tour back at the U.S. Navy Memorial.